Collecting a debt in Saudi Arabia can seem impossible. Language and cultural barriers, foreign laws and customs, and sheer distance all impose serious challenges. Debt recovery is simpler when you use a collection agency fluent in the laws and customs of the country where the debtor resides. Cedar Financial offers on-the-ground representatives in Saudi Arabia who understand the debt collection practices that work to support full recovery of your funds. With offices in over 150 countries, including Saudi Arabia, working with Cedar Financial provides you access to a global network of nationally licensed debt collectors. Our in-depth understanding of local laws, customs and cultures guarantees the best possible debt mediation results. Saudi Arabia has an oil-based economy with strong government controls over major economic activities. While Saudi Arabia does not have complex transfer pricing rules like other jurisdictions, transactions between related parties must be concluded on the basis that the parties are independent. The very notion of interest is contrary to Islamic law (Sharia). Therefore, interest for late payment is simply prohibited in Saudi Arabia and is not recoverable. Unless otherwise agreed, legal and other costs relating to enforcement proceedings are generally not recoverable in Saudi Arabia. Such clauses need to be carefully drafted to be enforceable under Sharia law. Saudi Arabia Debt CollectionIt is essential for Westerners doing business in the Kingdom to understand Saudi etiquette and the personal manner in which they conduct their business. Preparation and some basic knowledge of Saudi business culture can make the difference between a successful business deal and a failed negotiation. It is important to note, however, that a majority of Saudi business executives and government officials have studied and/or worked abroad, many of them in the United States. They are therefore familiar with the Western culture and are comfortable with its differing approach to business. Doing business in Saudi Arabia is somewhat more challenging than other GCC countries as law and order and deal binds are very strictly monitored. Debt collection in Saudi Arabia happens to be a very sensitive matter as earlier there was no concept of professional debt collection in Saudi Arabia. 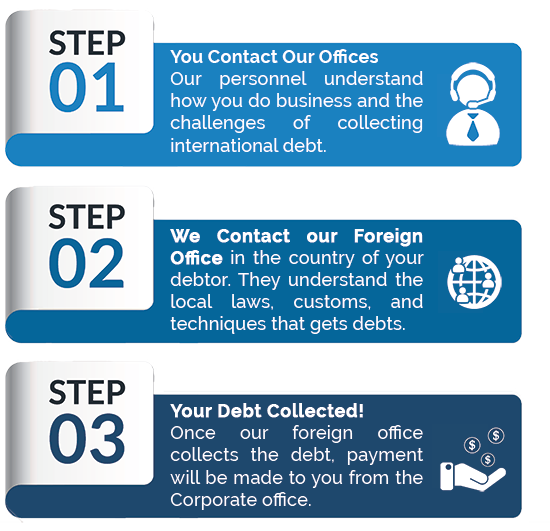 Unlike other debt collection services in Saudi Arabia, we employ a number of different divisions that connect people to the right debt collection service in the country. In addition, our network of collection agencies allows us to cater to larger businesses. Saudi Arabia has some of the best debt recovery laws and the legal system is very swift. KSA is a part of G.C.C which was established in view of the special relations between the gulf peninsulas, their similar political systems based on Islamic beliefs, joint destiny and common objectives. In KSA, carefully orchestrated pre-legal collection efforts are the key, as the sooner we act, the more the chances of a favorable outcome. The Saudi Arabian courts and judicial tribunals, including the Board of Grievances, do not award interest in any manner or form. However, interest provisions in an agreement are sever-able, and a contract will not, therefore, be ruled invalid solely because it includes interest related provisions. Interest-related transactions are not, therefore, illegal in Saudi Arabia. In essence, for a contractual obligation to be enforceable in Saudi Arabia, it must be clearly defined. There is no statutory law, Sharia law or time limit for bringing commercial claims in Saudi Arabia. Saudi Arabian law is silent on the issue of parties contractually agreeing to set time limits. Our team of professionals is specialized in the field of Labor cases, Contract, Agreements, Debt Collection, Reconciliation, Commercial Litigation and Intellectual Property services. Cedar Financial offers on-the-ground representatives who understand the debt Contract law and Legal system of Saudi Arabia and practice to ensure successful recovery of your money. Our services cover debt recovery through Courts and we ensure an efficient and quick enforcement of any Court Judgment and Order which includes preparation of claims for court procedure, filing of a claim, preparation of necessary documentation and representation of the client in enforcement proceedings. We can work on consumer (bank) accounts on a contingency basis. Our pre-legal debt collection services are at no win no fee basis. We only need the basic information; Name, address and a contact number, i.e. e-mail/fax/telephone etc. We can work on a letter service, whether on a fee per account or on an agreed rate. We can litigate: filing a case in KSA requires a notarized Power of Attorney from the client. The required attorney fees and costs differ from case to case, depending on a number of variables, such as the amount of the claim, the agreement between the parties and the relevant court fee. All cases are monitored for Conflict of Interest after a study and review of the file. A travel ban can be transferred or implemented in KSA but the conditions vary in each case. Cedar Financial always plans to negotiate a favorable way-out. Debt collection efforts may be simplified when contracts include strict payment terms as well as conditions deemed applicable should a late payment occur. In countries where Sharia law applies, matters relating to interest and late fee should be handled very prudently. Documents/contracts and all such bindings during business deals/loans need to be provided so that the law may be satisfied with ethical debt collection efforts. While working claims for various clients, our major role is to act local and think global and derive the middle ground to success. Contact Us today and start recovering the funds you are owed, faster. OR contact us at 1-800-804-3353 or complete our Online Inquiry Form.